Posted on December 5, 2017 at 2:45 pm. On Monday 8 January 2018 the Library is running a training session on the essentials of legal research for new pupils. The session takes place in the Inner Temple Drawing Room at 5.45 p.m. for a 6 p.m. start. It will finish around 7.30 p.m.
Posted on December 4, 2017 at 11:58 am. The Library will close for Christmas at 2.00 p.m. on Thursday 21 December and reopen at 9.00 a.m. on Thursday 4 January 2018. This calendar gives the opening hours of all four Inn Libraries over the Christmas vacation. Posted on November 3, 2017 at 10:18 am. A list of New Titles and New Editions received by the Library between July and September 2017 has just been published. Posted on November 2, 2017 at 9:34 am. We are sure that members of the Inns who have benefited from their legal research skills and comprehensive knowledge of the collections would wish to join us in congratulating two members of the library team, Michael Frost and Simon Hindley, on completing 30 years of service with the Inn. Posted on November 1, 2017 at 11:45 am. A number of design review meetings as well as meetings on temporary accommodation have taken place with heads of departments, the architects and consultants. Pre-application discussions on arrangements for temporary accommodation in the Garden and car park are taking place with the City planners. A further debate about Project Pegasus will take place at a future Bench Table meeting at which time Benchers will have full details of the project and a comprehensive cost analysis. There will be a further ballot after this discussion. Posted on October 24, 2017 at 9:36 am. The October issue includes an update on Project Pegasus; reports on recent outreach and training events for new students and pupils respectively; news of our revised Guide to sources of transcripts; and features on our contribution to celebrations of Black History Month, on new acquisitions, and on the Europe section of AccessToLaw. Posted on September 14, 2017 at 3:23 pm. On 26 September and 6 October the Deputy Librarian will be attending the Inner Temple’s introductory evenings for new students and will be happy to answer any questions about the Library and what it can offer. Posted on September 14, 2017 at 9:39 am. On 27 September BPTC students are invited to an open afternoon at the Library. The event will last from 1.00 p.m. to 5.00 p.m. and will begin in the Lawson Room, which is on the first floor just below the Library. The afternoon will include tours, demonstrations of the databases and our web-based services. There will be an orientation quiz with a prize draw (3 course lunch with wine for two in Hall) for those who complete it. All attendees will receive a tote bag containing an assortment of free gifts. Posted on September 8, 2017 at 1:38 pm. A new edition of the Library’s guide to sources of transcripts, last revised in 2011, is now available as a 174-page PDF document. 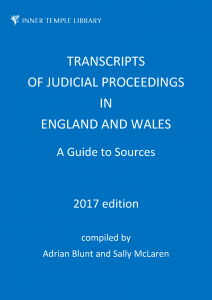 The guide is intended primarily for those who may need to obtain, or assist others to obtain, transcripts of proceedings in the courts and tribunals of England and Wales. While the basic arrangement is unchanged in this new edition, all existing entries have been checked and brought up to date, new courts and tribunals created since 2011 have been added, both the content and the layout of entries have been enhanced, and general information provided in the introduction and the appendices has been significantly expanded. Changes introduced recently to HM Courts and Tribunals Service’s transcription service are also covered. Further information and details of how to order the guide can be found on the Transcripts page of the website. Posted on September 6, 2017 at 1:53 pm. Members of staff from the libraries of Inner Temple, Lincoln’s Inn and Middle Temple will be attending freshers’ events at the London Bar schools. This is a good opportunity to meet library staff and to ask questions about services. There will be a lucky dip and the chance to take home a variety of library merchandise and gifts from the electronic publishers.